Designers, especially design students, rarely have access to children or their worlds when creating products, images, experiences and environments for them. Therefore, fine distinctions between age transitions and the day-to-day experiences of children are often overlooked. Designing for Kids brings together all a designer needs to know about developmental stages, play patterns, age transitions, playtesting, safety standards, materials and the daily lives of kids, providing a primer on the differences in designing for kids versus designing for adults. Research and interviews with designers, social scientists and industry experts are included, highlighting theories and terms used in the fields of design, developmental psychology, sociology, cultural anthropology and education. This textbook includes more than 150 color images, helpful discussion questions and clearly formatted chapters, making it relevant to a wide range of readers. It is a useful tool for students in industrial design, interaction design, environmental design and graphic design with children as the main audience for their creations. "Designing for kids is designing for the future. The objects both physical and virtual will mold a child's future and Krystina Castella's brilliant book will help designers bring that future to life." "When I reflect on what is truly unique about the design mindset, it always comes back to three things: impact, empathy, and play. In Designing for Kids, Castella provides educators and practitioners with actionable methodologies that help us excel at creating design artifacts that do just that." "Brilliantly written, comprehensive, and detailed guidebook on how to design and develop products exclusively for children. Enriched with case studies and learning tools from experts and thought leaders in the industry. A must have reference book for all times." "Designing for Kids is an excellent pedagogical toolbox for teachers who seek to innovate their work in the classroom with the latest approaches to design thinking.This book is a case study in design thinking itself with its meticulous attention to both theory and practice with foremost empathy for both the teacher and student. Castella does a magnificent job of tailoring her design thinking methods to specific development stages of a child — spanning cognitive, physical, and emotional dimensions. It’s destined to be a classic for any STEAM educator who seeks to master design thinking in the classroom." John Maeda, Global Head of Computational Design + Inclusion at Automattic, Inc.
"Thoughtful and breathtaking in its scope, Designing for Kids proves itself an invaluable resource. Krystina Castella melds her years of experience and expertise with nearly 100 interviews with industry professionals across a wide range of fields providing deep, real-world insights. Design Prompts throughout each section ask critical questions acting as launchpads inspiring deeper thought, creativity, and exploration! " "Not only is this book all you need to know about any sort of design, but it is also a comprehensive review of early child development. The tradecraft is right, and the background science is up to the minute." "This book is a comprehensive textbook analysis for any designer of playful objects and playgrounds. 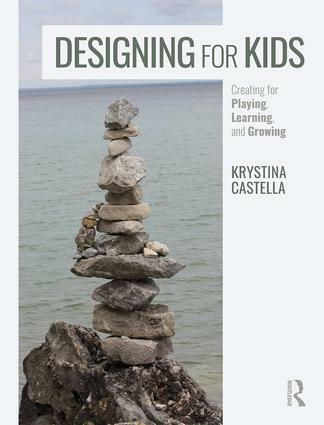 Krystina provides an in-depth analysis through the eyes of many very successful designers of children’s products as to how and why we as humans are wired to play throughout our lives. Her work provides great insight into understanding the complexity of designing a child’s product. This book will inspire us, old and new alike, to design a child’s product, toy or playful environment with a new perspective." "Learning through play empowers children to become creative, engaged lifelong learners. The ability to “make believe” can take people’s minds to places where no one has gone before. Weaving together insights from academic research with compelling interviews and project examples, Castella’s book makes a compelling case about the critical role that smart and socially responsible design has in unlocking the power of play. This is an inspiring read that is full of wisdom and best practices, one that every designer who aspires to create consequential products, services and experiences for children and teens will want to have on their library shelf." "From Skate Parks to ethics, Video games to Montessori education, and gendered toys to children’s drawing development; Krystina Castella has mapped the rich breadth of factors affecting designing for kids. This book summarizes these factors for designers, allowing both a high-level view and a detailed how-to level, of the design process for children." "An invaluable resource for both novice and experienced designers in the kid space. Filled with interesting and actionable takeaways, this book allows you to incorporate its teachings into your work immediately. It's delightful and inspiring, and well worth a read." Krystina Castella is a professor of industrial design and business at ArtCenter College of Design in Pasadena, California, USA. Krystinahas practiced as a designer and has taught at ArtCenter College of Design across disciplines for almost three decades. Her research and teaching center around designing for play, the intersection between design and ethical business, designing for social innovation, and sustainable materials and manufacturing innovation. Find out more about the author in our Q & A.
Krystina is available for speaking engagements. Please reach out to her marketer Samantha Wallace at Samantha.wallace@informa.com to schedule arrangements.